AP via Washington State PatrolThis photo provided by Washington State Patrol shows an Amtrak train that derailed south of Seattle on Monday. An Amtrak train derailed and was left dangling over a major highway in Washington state on Monday morning. At least three people died, dozens more were injured. Photos posted online depict the severity of the derailment. 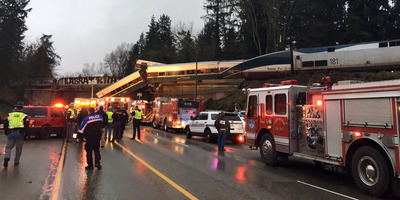 80 people and five crew members were on the train, authorities say. .
An Amtrak train derailed and was left dangling over a major highway in Washington state on Monday morning, and photos posted online by social media users and news outlets depict the severity of the incident. At least three people died, according to local law-enforcement. Nearly 100 people were taken to hospitals. There were 80 passengers and five crew members on the train from Seattle to Portland, according to Amtrak. Monday was the first day Amtrak’s Cascade trains were scheduled to run along this route, the result of a project to reduce travel time. Amtrak says those who have been unable to contact friends or family on or near the train can call 800-523-9101.